Background: Hernia is an abnormal protrusion of an organ or tissue through a defect in its surrounding walls which most commonly involves the abdominal wall, particularly the inguinal region. The treatment options for hernia ranges from simple exercises to modern surgeries. The effect of yoga therapy is not scientifically examined for reversible inguinal hernia and hence this study is undertaken with the aim to test the effect of selected asanas in reversible inguinal hernia. 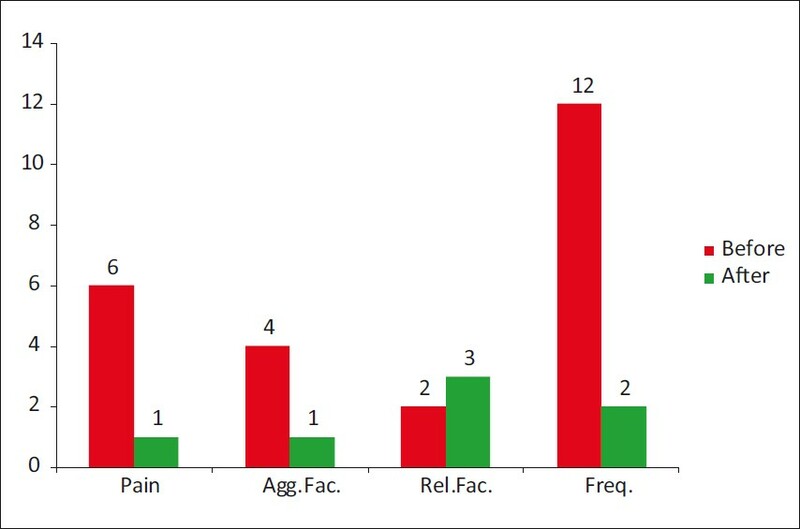 Materials and Methods: A quasi experimental trail of 19 males through consecutive sampling was done with selected asanas for three months and the outcome was measured by a questionnaire focusing on pain, aggravating factors, relieving factors and frequency of occurrence of symptoms of hernia. Results: The pre and post interventional data were compared statistically and found significant reduction of symptoms with P≤0.001 in pain, frequency of occurrence and aggravating factors. The relieving factors showed significant increase with P≤0.001. Conclusion: Yoga therapy with selected asanas is effective in the treatment of reversible inguinal hernia. Inguinal hernia is due to weakness of the abdominal muscles which holds the organs in their original positions. So the organ gets protruded through inguinal canal and sometimes to scrotum. The causes for inguinal hernia are congenital weakness or the developmental defect in the abdominal muscles or ligaments, unexpected pull while handling heavy item, which split the muscles and ligaments, elevated intra-abdominal pressure, flabbiness of the abdominal muscles and obesity. The treatment options for hernia range from simple exercises to modern surgeries. There are various research literatures ,,, listing the use of surgeries and their complications. The yoga therapy is suggested by various yoga practitioners through awareness magazines/articles, but not yet proved by any scientific research; hence this study was aimed at testing the effect of selected asanas on reversible inguinal hernia which is not an acute medical problem but need to be treated. The study was a quasi-experimental design and ethical clearance was obtained from institutional review board. Consecutive sampling was followed in selection of the samples. All males diagnosed with reversible inguinal hernia in the age range between 24 years and 46 years were included in the study. Subjects with hypertension, heart problems, recent fractures, arthritis or vertebral problems, where special care is needed or yoga therapy might pose risk were excluded from the study . Subjects diagnosed between 23 rd July 2009 and 22 nd Feb 2010 in study setting as reversible inguinal hernia fulfilling inclusion and exclusion criteria and willing to participate in the research were recruited for the study. The total number of participants was 19. All the subjects included in the study were treated with yoga therapy for duration of 3 months. Individuals who fulfilled the inclusion criteria were selected for the study by consecutive sampling method after obtaining informed consent from them. Pre-intervention assessment was done by using hernia questionnaire. After pre-intervention assessment, selected asanas were given for ten repetitions with corresponding breathing pattern followed by relaxation for 1 h daily for duration of three months. Initially asanas were done under the supervision of a trained yoga professional till the subjects become familiar with asanas. All subjects got familiarized with asanas in about two-weeks duration. Later they practiced the asanas at their home and follow up was once in a week. Yoga therapy was continued for three months and post intervention assessment was taken. Vajrasana, ushtrasana, paschimottanasana, pawanmuktasana, utthanpadasana, matsyasana and sarvangasana were selected based on its effects to compress inguinal canal, strengthen the abdominal muscles and to reduce the intra-abdominal pressure, because weakness or flabbiness of abdominal muscles and elevated intra-abdominal pressure may be the causes for the hernia in non-congenital subjects included in this study. Vajrasana is a meditative asana not involving much of muscle work and was used as a preparatory for yoga therapy with added benefits of compressing inguinal canal which will prevent protrusion of abdominal contents. Ushtrasana and paschimottanasana were included based on the principle of proprioceptive neuro muscular facilitation technique namely repeated stretch  i.e. the stretch reflex elicited from muscles under the tension of elongation will facilitate muscles to contract. Ushtrasana will facilitate abdominal muscles to stretch and paschimottanasana will facilitate them to contract along with compression over inguinal canal. Pawanmuktasana strengthens abdominal muscles, compresses inguinal canal and also reduces intra-abdominal pressure by releasing air from gastro intestinal tract and utthanpadasana has got direct strengthening effect over abdominal muscles. Matsyasana is complementary to sarvangasana included to neutralize the flexion force created over the normal neck and sarvangasana is to move abdominal contents toward thorax thereby reducing abdominal pressure and to prevent protrusion of abdominal contents or to facilitate replacement of herniated contents. The pre-intervention and post-intervention assessments were carried out by using the hernia questionnaire designed for this study. This includes the details about intensity of pain, relieving factors, aggravating factors and frequency of occurrence in last two weeks which were used for analysis along with the general information. Schedule method of data collection was used. Data analysis including descriptive analysis and inferential analysis were done by using computerized software (SPSS-11.5) Statistical package for social sciences, Version 11.5 for windows. Descriptive statistics includes measures of central tendency specifically the median and measures of dispersion namely minimum, maximum, first quartile, third quartile and quartile deviation for all the studied dependent variables before and after intervention. Inferential statistics of significance testing was done by using Wilcoxon signed-rank test with asymptomatic two tailed z test for paired observations i.e. before and after intervention for all studied variables. Nineteen subjects participated in the study. General information like age, side of bulge, first occurrence of symptoms, activity during first occurrence and effect of rest were also recorded for all participants as applicable. Age of the subjects ranged from 24 to 46 years, with the mean of 36.26 years and standard deviation of 7.43 years. Out of nineteen subjects studied, ten presented with left side hernia, eight with right side hernia and remaining one presented with hernia on both sides. Out of nineteen studied, eleven subjects were not able to retrieve any detail about first occurrence of the problem. For six subjects, the problem occurred during activity and taking rest relieved it. Remaining two was not clear about the exact activity during occurrence, but they gave the approximate duration of their problem. For all the subjects, there was no history of previous hernia. Intensity of pain was measured with numeric pain rating scale starting from zero to ten where zero indicates no pain and ten indicates maximum tolerable pain, which was a part of the hernia questionnaire. Pain intensity before intervention ranged from three to eight with median of six and quartile deviation of one. Pain intensity after intervention was from zero to three with median of one and quartile deviation of one [Table 1], [Figure 1]. The z value of Wilcoxon signed-rank test which is equal to −3.864 with P value<0.001 denotes that there is statistically significant reduction in pain after intervention. The participants were asked which of the five most common activities exacerbate the problem. The activities are exercise/walking, bowel movement, bladder activity, lifting and coughing/sneezing. Out of nineteen participated, 9 showed the presence of three activities, 6 showed the presence of four activities and remaining 4 showed the presence of all five activities before intervention. After three months of intervention with selected yogasanas, 14 subjects presented with the presence of two activities to increase the problem, 1 presented with one activity and the remaining 4 subjects presented with no activity to increase the problem out of the five commonly found activities. Wilcoxon signed-rank test z value of −3.875 with P<0.001 denotes that there is statistically significant reduction in aggravating factors after yogic practice [Table 2], [Figure 1]. The symptoms of inguinal hernia may be relieved by three activities which reduce the intra-abdominal pressure viz. sleeping, lying down and sitting which were also asked for its presence. Out of nineteen subjects participated, seven showed the presence of one relieving factor, another seven showed the presence of two relieving factors and the remaining five showed the presence of al three relieving factors before intervention. All nineteen subjects showed the presence of all three relieving factors after intervention [Table 3], [Figure 1]. The z value of Wilcoxon signed-rank test which is equal to 3.391 with P<0.001 denotes that there is statistically significant increase in relieving factors of inguinal hernia after intervention. Frequency of occurrence of the hernia i.e. number of times in last two weeks were also analyzed before and after intervention. The median for frequency of occurrence before intervention is twelve times with range from nine to fourteen times per two weeks. Frequency of occurrence reduced from zero to six times with median of two times after practise of yoga. The z value of Wilcoxon signed-rank test which is equal to−3.835 with P value<0.001 denotes that there is statistically significant reduction in frequency of occurrence of symptoms of hernia after intervention [Table 4], [Figure 1]. This quasi-experimental trial studied the effect of yoga therapy in subjects with reducible inguinal hernia. The result shows that yoga therapy is significantly effective in the management of reducible inguinal hernia in males. The results of some studies ,,, explain the complications associated with surgical repair of hernia. So hernia can be better treated without surgery if it is not an acute health threat. Ancient health science will be much helpful, cost effective and can be used as an adjunct to physiotherapy or medical practise. The results of current study are also supported by the following articles. Current study focuses on selected asanas only and it is further recommended to experiment with more number of asanas, pranayama, bandhas and mudras in large randomized sample with control group in more homogeneous sample including both sexes for long term follow-up effects. Yoga therapy with selected asanas is effective in the treatment of reversible inguinal hernia. 1. Townsend Jr CM, Beauchamp RD, Evers BM, Mattox KL, Sabiston textbook of surgery the biological basis of modern surgical practice. 17 th ed. Philadelphia: Elsevier; 2004. 2. First Exposure to General Surgery. In: Jacobs DO, editor. New York: The McGraw-Hill Companies Inc; 2007. 3. Russell RCG, Williams NS, Bulstrode CJ. Bailey and love's short practice of surgery. 24 th ed. London: Hodder Arnold; 2004. 4. Taylor EW, Duffy K, Lee K, Hill R, Noone A, Macintyre I, et al. Surgical site infection after groin hernia repair. Br J Surg 2004;91:105-11. 5. Kalliomäki ML, Meyerson J, Gunnarsson U, Gordh T, Sandblom G. Long-term pain after inguinal hernia repair in a population-based cohort; risk factors and interference with daily activities, Eur J Pain 2008;12:214-25. 6. Bay-Nielsen M, Perkins FM, Kehlet H, Pain and functional impairment one year after inguinal herniorrhaphy: A nationwide questionnaire study, The Danish Hernia Database. Ann Surg 2001;233:1-7. 7. Bay-Nielsen M, Nilsson E, Nordin P, Kehlet H. Chronic pain after open mesh and sutured repair of direct inguinal hernia in young males. Br J Surg 2004;91:1372-6. 8. Adler SS, Beckers D, Buck M. PNF in Practice-An Illustrated Guide. 3 rd ed. Germany: Springer; 2008, p. 29. 9. Millikan KW, Deziel DJ. The Management of Hernia-Considerations in cost effectiveness. Surg Clin North Am 2005;76:105-16. 10. Dr. R. Nagarathna, Dean, Division of Yoga and Life-sciences, SVYASA Available from http://www.healthandyoga.com/html/news/therapy/therapy85.asp [Last accessed on 2009 May 05]. 11. YJ Staff. Available from: http://www.yogajournal.com/practice/237 [Last accessed on 2009 May 05].